50 SEPTEMBER 20 - 26, 2017 WWW.UPANDCOMINGWEEKLY.COM GOODS & SERVICES GOODS & SERVICES Owner Robin Matthews w/ Mother www.ABitOfCarolina.com | 910-551-6537 | 306 Hay St. Fayetteville, NC 28301 Thank You Fayetteville for Voting Us Best Store for Unique Gift! NC Made Specialty Items • Food Baskets • Gifts • Local Faith Farm Honey Voted Best Pet Sitter! Thank you to our wonderful clients and everyone who voted! Let your pet stay Healthy & Happy at HOME! 910.987.3141 www.CarolinaPetCare.com Pet Sitting Dog Walking Customized Care Plans Licensed | Bonded | Insured Serving Fayetteville, Hope Mills & Raeford since 2004! UP & COM ING W EEK LY 'S Est. www.CarolinaPetCare.com 910.987.3141 2004 Voted Best Pet Sitter! Thank you to our wonderful clients and everyone who voted! Let your pet stay Healthy & Happy at HOME! 910.987.3141 www.CarolinaPetCare.com Pet Sitting Dog Walking Customized Care Plans Licensed | Bonded | Insured Serving Fayetteville, Hope Mills & Raeford since 2004! UP & COM ING W EEK LY 'S Est. www.CarolinaPetCare.com 910.987.3141 2004 Voted Best Pet Sitter! Thank you to our wonderful clients and everyone who voted! Let your pet stay Healthy & Happy at HOME! 910.987.3141 www.CarolinaPetCare.com Pet Sitting Dog Walking Customized Care Plans Licensed | Bonded | Insured Serving Fayetteville, Hope Mills & Raeford since 2004! UP & COM ING W EEK LY 'S Est. www.CarolinaPetCare.com 910.987.3141 2004 Voted Best Pet Sitter! Thank you to our wonderful clients and everyone who voted! Let your pet stay Healthy & Happy at HOME! 910.987.3141 www.CarolinaPetCare.com Pet Sitting Dog Walking Customized Care Plans Licensed | Bonded | Insured Serving Fayetteville, Hope Mills & Raeford since 2004! UP & COM ING W EEK LY 'S Est. www.CarolinaPetCare.com 910.987.3141 2004 Voted Best Pet Sitter! Thank you to our wonderful clients and everyone who voted! Let your pet stay Healthy & Happy at HOME! 910.987.3141 www.CarolinaPetCare.com Pet Sitting Dog Walking Customized Care Plans Licensed | Bonded | Insured Serving Fayetteville, Hope Mills & Raeford since 2004! UP & COM ING W EEK LY 'S Est. 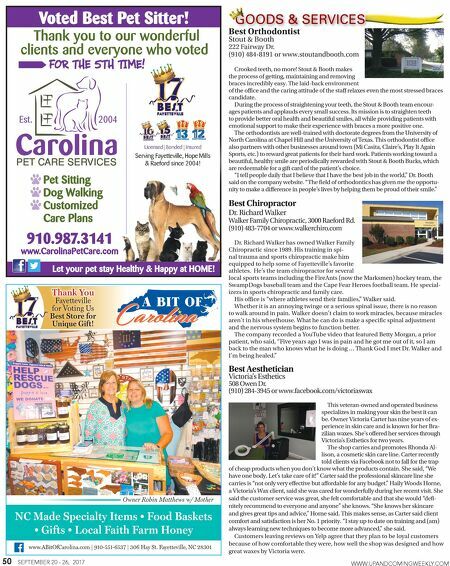 www.CarolinaPetCare.com 910.987.3141 2004 for the 5th time! Best Orthodontist Stout & Booth 222 Fairway Dr. (910) 484-8191 or www.stoutandbooth.com Crooked teeth, no more! Stout & Booth makes the process of getting, maintaining and removing braces incredibly easy. The laid-back environment of the office and the caring attitude of the staff relaxes even the most stressed braces candidate. During the process of straightening your teeth, the Stout & Booth team encour - ages patients and applauds every small success. Its mission is to straighten teeth to provide better oral health and beautiful smiles, all while providing patients with emotional support to make their experience with braces a more positive one. The orthodontists are well-trained with doctorate degrees from the University of North Carolina at Chapel Hill and the University of Texas. This orthodontist office also partners with other businesses around town (Mi Casita, Claire's, Play It Again Sports, etc.) to reward great patients for their hard work. Patients working toward a beautiful, healthy smile are periodically rewarded with Stout & Booth Bucks, which are redeemable for a gift card of the patient's choice. "I tell people daily that I believe that I have the best job in the world," Dr. Booth said on the company website. "The field of orthodontics has given me the opportu - nity to make a difference in people's lives by helping them be proud of their smile." Best Chiropractor Dr. Richard Walker Walker Family Chiropractic, 3000 Raeford Rd. (910) 483-7704 or www.walkerchiro.com Dr. Richard Walker has owned Walker Family Chiropractic since 1989. His training in spi- nal trauma and sports chiropractic make him equipped to help some of Fayetteville's favorite athletes. He's the team chiropractor for several local sports teams including the FireAnts (now the Marksmen) hockey team, the SwampDogs baseball team and the Cape Fear Heroes football team. He special - izezs in sports chiropractic and family care. His office is "where athletes send their families," Walker said. Whether it is an annoying twinge or a serious spinal issue, there is no reason to walk around in pain. Walker doesn't claim to work miracles, because miracles aren't in his wheelhouse. What he can do is make a specific spinal adjustment and the nervous system begins to function better. The company recorded a YouTube video that featured Betty Morgan, a prior patient, who said, "Five years ago I was in pain and he got me out of it, so I am back to the man who knows what he is doing … Thank God I met Dr. Walker and I'm being healed." 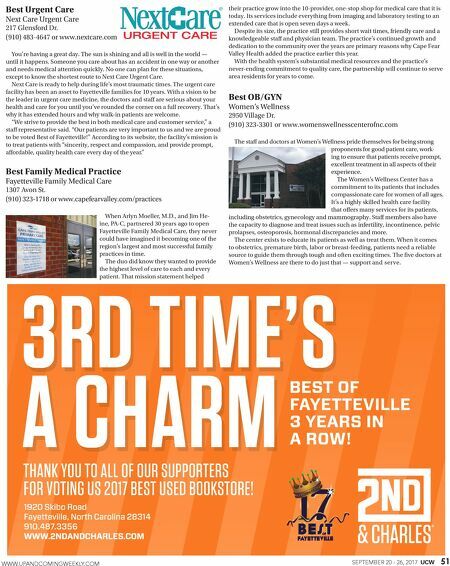 Best Aesthetician Victoria's Esthetics 508 Owen Dr. (910) 284-3945 or www.facebook.com/victoriaswax This veteran-owned and operated business specializes in making your skin the best it can be. Owner Victoria Carter has nine years of ex- perience in skin care and is known for her Bra- zilian waxes. She's offered her services through Victoria's Esthetics for two years. The shop carries and promotes Rhonda Al- lison, a cosmetic skin care line. Carter recently told clients via Facebook not to fall for the trap of cheap products when you don't know what the products contain. She said, "We have one body. Let's take care of it!" Carter said the professional skincare line she carries is "not only very effective but affordable for any budget." Haily Woods Horne, a Victoria's Wax client, said she was cared for wonderfully during her recent visit. She said the customer service was great, she felt comfortable and that she would "defi - nitely recommend to everyone and anyone" she knows. "She knows her skincare and gives great tips and advice," Horne said. This makes sense, as Carter said client comfort and satisfaction is her No. 1 priority. "I stay up to date on training and (am) always learning new techniques to become more advanced," she said. Customers leaving reviews on Yelp agree that they plan to be loyal customers because of how comfortable they were, how well the shop was designed and how great waxes by Victoria were.